500 feet or higher than head height can produce lethal results!!!! This file is for information and entertainment. you do so entirely at your own risk! 1. The long wire acts as an antennae and a capacitor and as it builds up charge, it discharges a spark that jumps the gap, is then stepped down by the coil, and then pulsed to the battery through the use of the capacitor. This is my simple view of the device. The long wire captures radiant energy, as the charge builds up and jumps the gap, spark (longitudinal waves) it is then stepped down in the coil, (for those who do not know it the coil in your car was invented by Tesla and is a small Tesla coil,) it is then charging the battery where it is transformed via a square or PWM wave at low frequency and is the reactive power that charges your battery. It works and as far as I am concerned is all that matters. The end of the coax is taped off and the end that is attached to the spark plug the wires are twisted together. 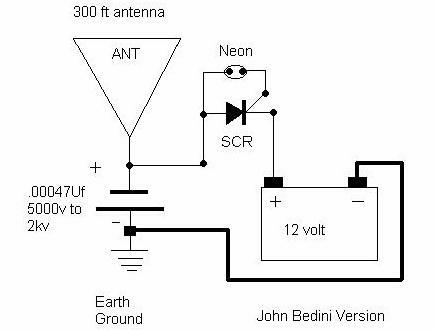 According to John Bedini, as he explained to me when you cut one end off and twist the other two ends together, what you have is a high dielectric absorber antennae, the positively charged particles from the atmosphere get trapped in between the skin and the inner wire making a condenser of sorts. The rate of charge in the wire that is oscillating in nature at one frequency and the discharge freqency in sharp DC transient pulse to the battery that is at its own rate. If you look at the pulse rate it would almost look like a triangle wave flattened off and would follow the gravitational wave frequency of about 8KHZ. 1. Using either regular insultaed wire or coax, waterproof the end, the wire or coax may be laid out in any fashion as long as it is insulated from any potential ground and to itself. 2. 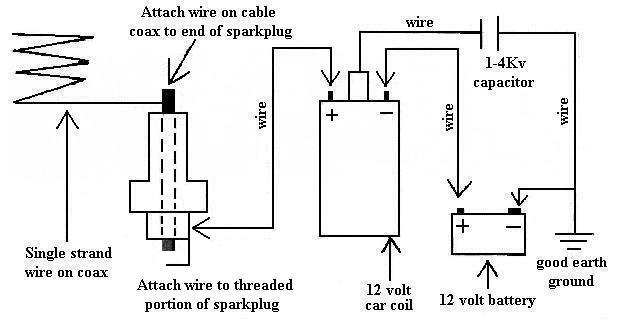 Attach the wire (coax twist the ends together first) and attach it to the end of the spark plug. 3. Attach a wire to the threaded portion of the spark plug (the end that goes in to your motor) and attach it to the positive (+) of your 12 volt car coil. 4. 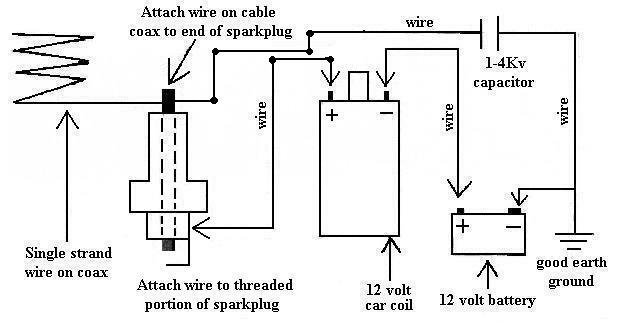 Attach a wire to the negative (-) of the 12 volt car coil and attach it to the (+) positive terminal of a 12 volt battery, I prefer deep cycle batteries, but for basic experimentation purposes I don't think it will matter. 5. Attach a wire from the taller center of your car coil to a 1-4Kv capacitor (a few picofarad will do) and then a wire from the other leg of the capacitor to a good earth ground and to the negative (-) terminal of the battery.